There are 4 shops proposing this game for download at an average price of $ 19.48. We found the best promotion ongoing with a discount of 10%. 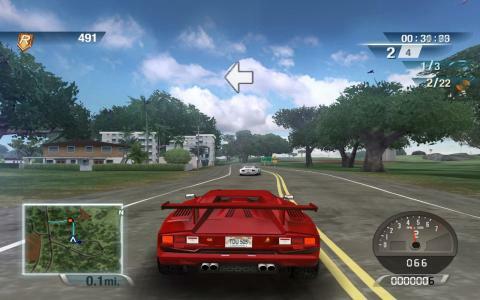 The original Test Drive Unlimited was a pretty solid open-world racing game somewhat akin to Need For Speed: Underground that allowed you to live your driving dreams on a paradise island filled with possibilities (and of course, hot racing cars). This sequel is still a fine experience but it just misses out on being great because of a few nagging issues. This time around, the game gives you two islands to speed around, Ibiza and Ohahu, and places you in the role of a valet who gets the chance to drive a rich girl to her studio. Perform well enough and you might just get the chance to take part in a series of racing competitions. After getting your licence, the game really kicks off and you're now basically free to drive around, looking for challenges and races to take part in. There are many challenges to find, including bizarre ones like driving someone home who suffers from car sickness, tailing someone and picking up an adrenaline nut who gets off on speed. There's a massive range of vehicles to try out, lots of options to tweak and other elements like a day/night cycle, all of which combine to create an intriguing open world experience. Some of the challenges on offer here are a tad dull (driving safely, really?) but if you can skip these, there's a lot of fun driving action to be had. The two islands are well created and pretty thrilling to race around, with lots of jumps and places to perform stunts to be found. The visuals are slick, with a great sense of speed, but the lifestyle elements are largely uninteresting, and the controls take some getting used to. Stick with it though, and there's a sound racer here.